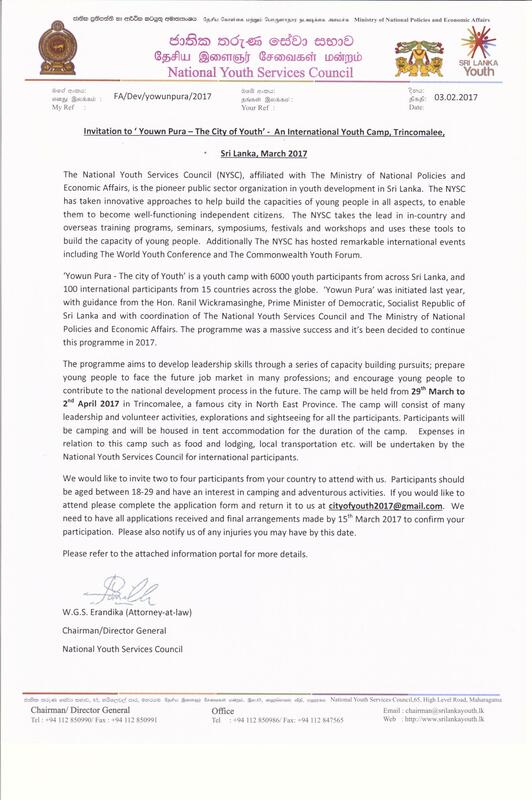 We are pleased to inform you that the National Youth Services Council, Sri Lanka is calling for participation for the 'Yowun Pura - The City of Youth' International Youth Camp that shall be held from 28th March to 2nd April 2017. This exciting event is expected to be attended by approximately 6000 Sri Lankan youth and 100 international delegates, hosted in the beautiful beach town of Trincomalee in the North Eastern Province, Sri Lanka. This programme will also include capacity building activities, such as: outwards bounds activities, sporting events, community service work, cultural shows and many more. Thus, the organiser would like to invite two to four participants, aged between 18-29 years old from your esteemed organisation to join this event. Online registration is now open at https://yowunpura2017.typeform.com/to/fuXcPT.